Creativity is a hallmark of the North Carolina Museum of Art. It should come as no surprise, then, to find innovative cuisine at Iris, the NCMA’s full-service restaurant that’s as worthy of exploration as any exhibit hall. Not surprisingly, Iris is aesthetically impressive at first glance. The expansive, modern dining room is suffused with natural light thanks to abundant windows that extend from floor to ceiling. 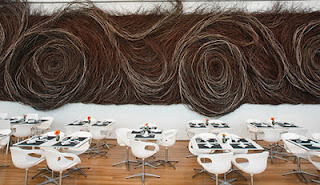 An adjacent wall features a massive natural, woven sculpture created by local artist Patrick Dougherty. Also distinctive is the restaurant’s contemporary American gastronomy with a Southern fusion approach. Executive Chef Andy Hicks, who honed his culinary chops at various triangle restaurants, including Chapel Hill’s La Residence, draws from regional and global influences while sharing kitchen duties with Executive Pastry Chef Jennifer Hicks, his wife. Among both chefs’ primary passions is a commitment to sourcing local ingredients whenever possible. Whether it’s beef, seafood, vegetables or dairy products, there’s total dedication to using the freshest provisions available from places like Chapel Hill Creamery and Celebrity Dairy in Siler City. The assurance of excellence and freshness is evidenced by the first-rate bill of fare. Consider, for instance, the Iris burger, which features all-natural, grass-fed beef from Rare Earth Farms along with Hickory Grove cheese and green peppercorn chive sauce. While the restaurant’s menu changes with the seasons, popular items like chicken salad and pork barbeque are often carried over. When it comes to dessert, Jennifer’s masterful creations range from fruit-imbued crumbles and dark chocolate brownies to house-made sorbets and ice cream. Service at Iris is excellent. Attractive, well-trained staff members handle their duties effectively and efficiently. Closed Monday, Iris is open for Tuesday through Saturday from 11:30 a.m.-2 p.m. Friday dinner is served from 5:30-10 p.m. (final seating at 8:30 p.m.). Brunch is served on weekends; Sunday hours are 10:30 a.m.-2:30 p.m. Reservations are accepted and encouraged. 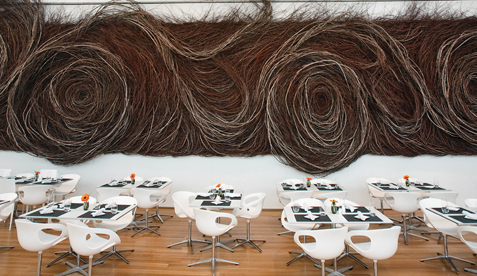 Current NCMA members are eligible a 10 percent discount off their meal. Museum admission is free.